As the population of Houghton-le-Spring grew, so did the number of taverns, inns and public houses. At one time there were over forty open at the same time, meaning Houghtonians were spoilt for choice when it came to deciding where to relax after a hard day's graft. The following articles give an overview of these many pubs, as well as a closer look at each pub. Many are now gone and forgotten but the opening of Wetherspoon's Wild Boar on Frederick Place in 2011 has shown that there is still a demand for a nice pint! 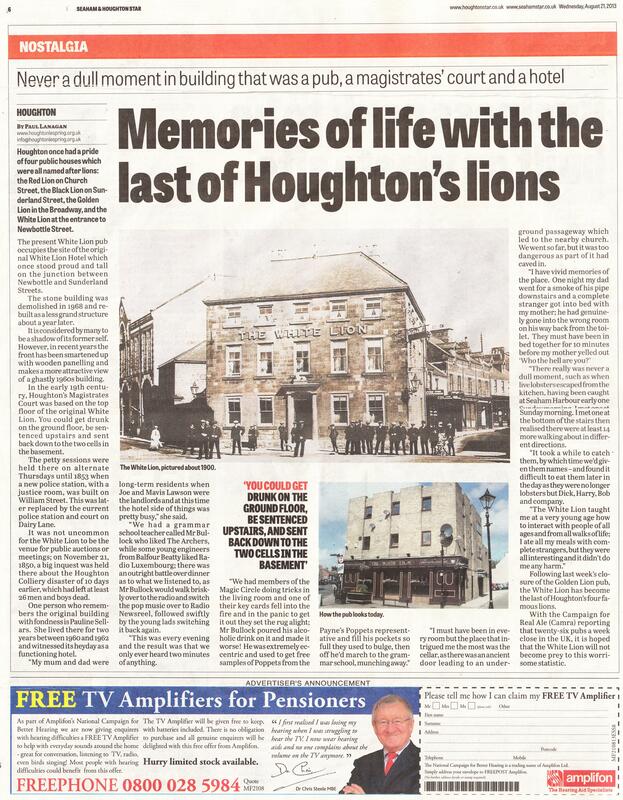 An article examining noteworthy pubs from the burgeoning list of around fifty inns and taverns in Houghton-le-Spring. Included are memories and photographs of a few favourites. The White Lion Hotel stood at the junction of Newbottle and Sunderland Streets. The original domineering pub, which housed the magistrates on the top floor, was replaced during the redevelopments of the 1960s. 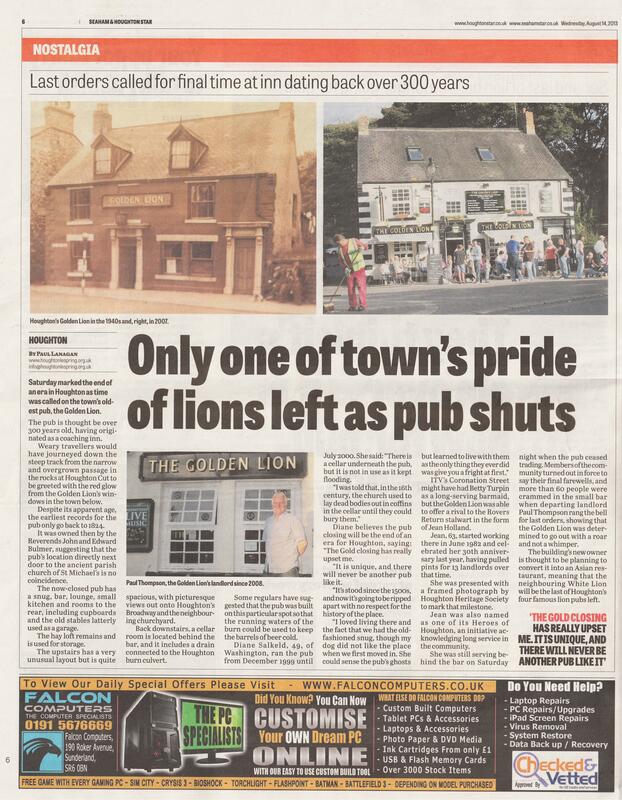 The Golden Lion is thought to be Houghton’s oldest pub and originated as a coaching inn. The earliest records go back to 1824 but the pub is certainly much older, including the stables at the rear. The former malting house of the City Brewery is located in the centre of Houghton, on Durham Road, perched next to a large roundabout above the A690, and was owned by the influential Robinson family. 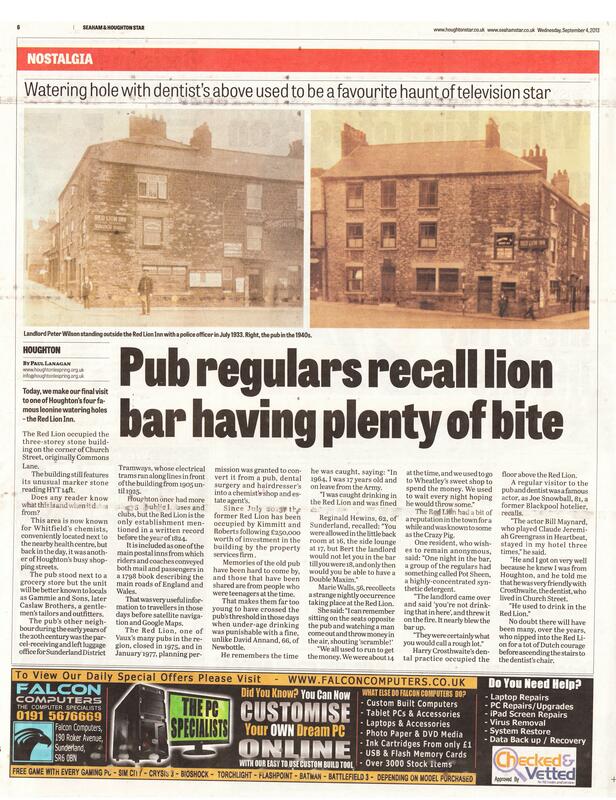 The Red Lion Inn stood on the corner of Church Street and Durham Road and was ideally situated to capitalise on trade from the busy crossroad. The pub closed in 1975 and is now used as commercial premises. 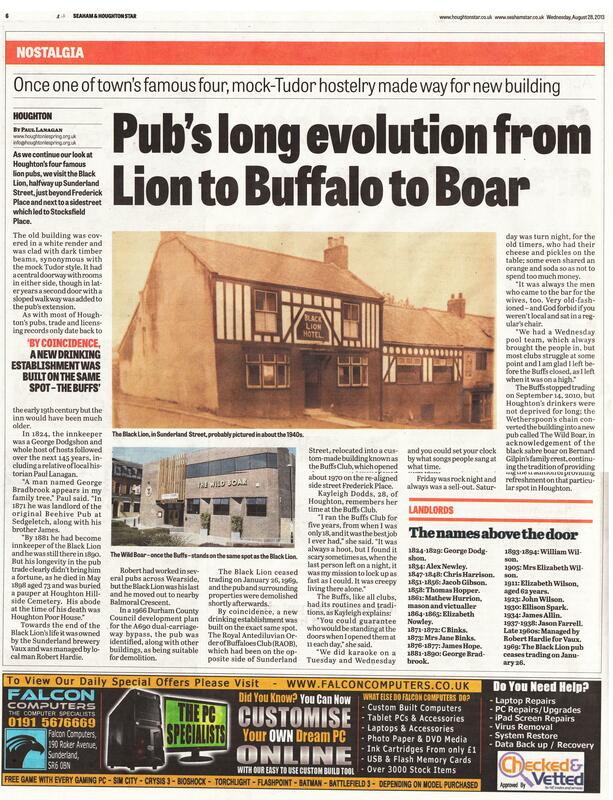 The Black Lion, which was located on the east side of Sunderland Street, ceased trading on January 26th 1969 and was another of the buildings demolished as part of the redevelopment of Houghton. Named after the coat of arms of the Lambton family, this pub was renovated in 2002 following a fire in the late 1990s. It became known as Lambton House, a series of business units. Originally known as the Market Taven, the Jolly Farmers pub became known as the Spring Inn in recent years. It now stands empty and is available for sale as of summer 2011. A modern dwelling house stands on the site of the Black Horse pub, at 22 Market Place. Redevelopment works took place in the area between 1960 and 1963 which is when it was possibly demolished. Known as the Wheatsheaf Inn and the Wheatsheaf Hotel, this pub appears to have met its end when the lucrative and crowd-pulling Houghton Feast fair relocated in 1968. It was converted to a house in 1973. The Royal Antediluvian Order of Buffaloes relocated from Sunderland Street into a purpose made building on Frederick Place; the Buffs closed in 2010 and a Wetherspoons opened in 2011. The Old Bank was a short-lived venture on Sunderland Street in 2008/9 and was previously known as Flynns, the Ivy Nightclub, Kelly's bar and others. It was originally a branch of Martins Bank. The Copt Hill Inn stands on a lonely spot on Seaham Road, looking down on the rest of Houghton, within the shadows of the Neolithic burial site known as the Seven Sisters. It is another of Houghton's haunted pubs. The Robbie Burns Hotel, as it was known, stands on the middle of Newbottle Street, conveniently attracting the performers from the the two theatres opposite. It is thought to be Houghton's most haunted building. Houghton Social Club, known as the Big Club, was established on Newbottle Street in 1904. In 1917 it purchased Houghton Hall and was there until 1965 when it moved next door into the new Club building. The Lamb Inn is another of Houghton's many demolished public houses. The site is now the location of a roundabout on the A182 at the north end of Newbottle Street. The Nag's Head pub stood at 97 Newbottle Street, very close to the Lamb Inn, but is now long gone following the redevelopments of Houghton-le-Spring town centre in the 1960s. The Queen's Head pub was known locally as the Pillars and stood on the west side of Sunderland Street. The pub ceased trading on November 3rd 1958 and was demolished. The A690 now crosses the site. The Bay Horse publice house stood at 60 Sunderland Street, the second property up from the George Street opening. It was demolished in May 1968 along with the other properties on Sunderland Street. The Britannia Inn appears to have been rebuilt between c1895 and c1910 when comparing photographs of the entrance of Newbottle Street. The main entrance door into the pub was relocated around 2006. Now known simply as The Burn, formerly the Burn Hotel and the Burn Inn, this pub stands alongside the crossroads of Gillas Lane and Hetton Road opposite Houghton's Mines Rescue Station. The Colliery Inn was located next to Houghton's colliery (hence the name) on Quarry Row. It was also known as the Tavern and as The Grasswell in the 1970s. Large billboards now stand on the location of this pub. The Halfway House pub was half way between Newbottle and Houghton and stood opposite the colliery gates, next door to the pit school and on the same side as the quarry entrance. The spot is now grassed over. The County Arms pub stood at 54 Sunderland Street next to the George Street opening (the Gospel Hall was just behind it). The County Arms closed on April 17th 1969 and demolished shortly afterwards. The Newcastle Arms stood on Newbottle Street to the immediate right of the Pottery Yard opening (on what is now Unit 11, White Lion Buildings). To its left was the Royal Oak Inn. Both pubs were demolished. The Mill Inn pub is located at Rainton Bridge on Durham Road. The pub is one of Houghton's surviving public houses and appears to be prospering thanks to the delicious meals on offer there. Houghton's Sunn Inn (not to be confused with the one at Newbottle) stood at the entrance to the Market Place, next to Nesham Place, and backed on to the Lake grounds. It prospered thanks to Houghton Feast. The Glendale Club was originally located in the old Catholic Institute building at 10 Church Street (now Glendale House) but by 1966 had moved to new premises on Hall Lane. The Club is CIU affiliated. The original Beehive stood opposite the sewage works at Sedgeletch but moved up to the Coaley Lane and Blind Lane crossroads in the 1930s, closer to its customers at Sunniside and the Homelands Estate.